Intelligent Mail barcodes are used in the USPS mail stream to increase the efficiency of deliveries. Intelligent Mail barcodes combine routing ZIP code information and tracking information into a single 4-state code. It encodes data from POSTNET and PLANET barcodes into a single barcode while providing a greater range of tracking data. POSTNET barcodes encode a ZIP code or ZIP+4 code into half and full-height bars. Most often the delivery point is added, usually being the last two digits of the address or PO box number. In 2013, POSTNET barcodes were replaced with Intelligent Mail barcodes (IMB) by the USPS. IMB symbols encode data in 4-state bars which can be one of: tracker, descender, ascender, or full height bars. Correctly printing IMB symbols is critical for commercial mailers, as the USPS imposing penalties (in the form of higher postal rates, or non-approval of mail systems) for non-conforming symbols. However, it is almost impossible to know if an IMB system will meet USPS requirements. Webscan bar code verifiers fill this void by applying tests to IMB symbols according to requirements specified in USPS-B-3200. 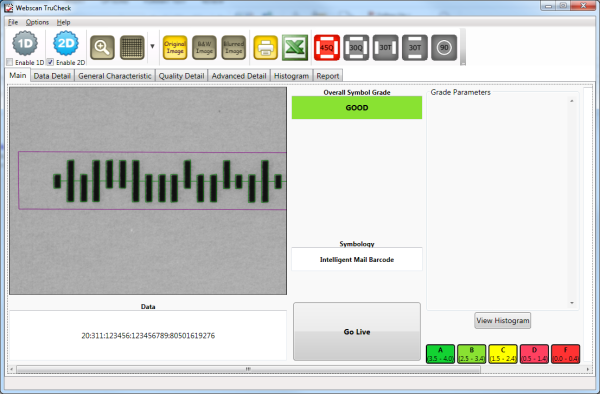 Support for Postnet and Intelligent Mail Barcode (IMB) is available as an optional feature in Webscan barcode verifiers. To enable this feature, a license file must be purchased and loaded into the verifier unit (under the Help Menu, Activate Feature). The license file is tied to the “Board Serial Number” found in the Help About window in the software. Postnet and IMB symbols are verified in accordance with USPS-B-3200 and Merlin* test criteria and reported with Pass (meets USPS requirements), Good (does not pass all USPS-B-3200 requirements but does pass Merlin test criteria), Warning (does not pass all USPS-B-3200 requirements and generates a “Warning” message under “Merlin” test criteria) or Failure (does not pass all USPS-B-3200 requirements and generates a “Failure” message under “Merlin” test criteria). A visual representation of each passing and failing feature of the symbol is shown on the results screen and itemized in the report for each bar of the symbol. Bar spacing, rotation, minimum and maximum height, minimum and maximum width, bar continuity, pitch, clear zone reflectance, symbol skew, are all graded and reported. ** Also, the orientation of the symbol (forward or backward/upside down), including mirror image, is automatically detected and reported. * Merlin test criteria are not published by USPS and have been derived according to the best available information. ** Decoding method is not specified by USPS to interpretation of bar orientation and other parameters are subject to Webscan’s implementation.